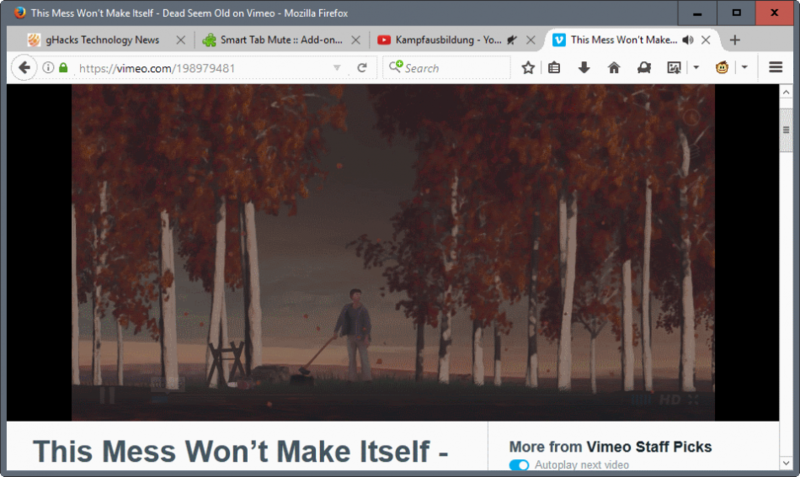 Smart Tab Mute is a browser add-on for the Firefox web browser that limits audio playback in the browser to a single tab at a time. If you open five tabs with videos, games and other content that plays audio in your browser of choice, you may notice that audio starts to play out of all five tabs regardless of active tab. While that may not be such an issue, the fact that audio playback is enabled for all five tabs as well is one. There are manual ways around this, for instance by never opening more than one tab that plays audio at a time, or by pausing any secondary video or audio stream. 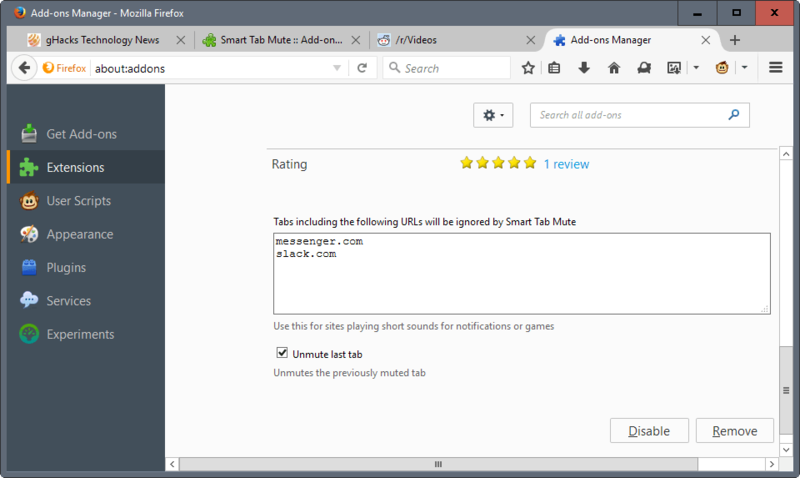 Note: Smart Tab Mute is based on a Google Chrome extension. If you use Chrome, you can download and install the extension to get the same functionality. 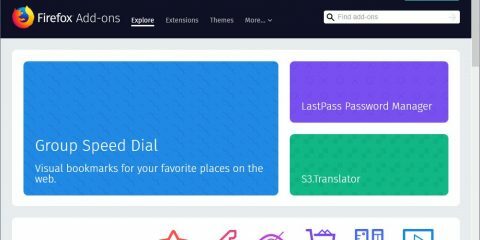 Smart Tab Mute is one of those browser extensions that you don’t interact directly with. It sits silently in the background, and becomes active automatically when a second or more tabs are opened that play video. It uses a straightforward algorithm to determine what to do then. Any audio playing tab that is in the background gets muted automatically, while the foreground tab continues to play audio. If the foreground tab does not play audio, the last tab that gets opened is allowed to play audio, while all other tabs are muted automatically. The audio playing tab that was opened second last is allowed to play audio automatically when you close that last tab, and so on. This means that audio playback is started automatically in this situation, so that you don’t even have to click on the mute icon or even switch to the tab to start playback. Smart Tab Mute won’t interfere with audio elements that you have stopped or paused manually however. It won’t start those videos or media streams on its own again if that is the case. The add-on ships with two options that let you control the behavior somewhat. The first blocks the unmuting of the last tab automatically when the currently playing tab is closed. The second option provides you with a blacklist of sites that you want to exclude from the add-on’s functionality. This can be useful if you want to ensure that a service may always play audio, for instance when it uses audio for its notification system. 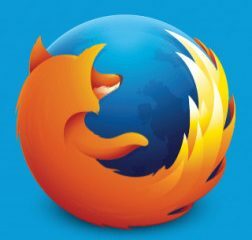 Smart Tab Mute is a useful Firefox add-on for users of the browser who run sometimes or often into situations where multiple sites start to play audio at the same time. 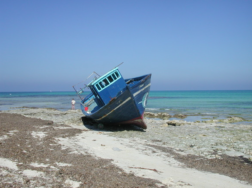 Now You: Did you ever run into audio playback issues in your browser of choice? The post Limit Firefox audio playback to one tab appeared first on gHacks Technology News.